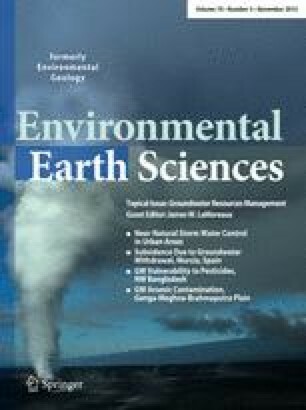 The authors’ survey of the Ganga–Meghna–Brahmaputra (GMB) plain (area 569,749 km2; population >500 million) over the past 20 years and analysis of more than 220,000 hand tube-well water samples revealed groundwater arsenic contamination in the floodplains of the Ganga–Brahmaputra river (Uttar Pradesh, Bihar, Jharkhand, West Bengal, and Assam) in India and the Padma–Meghna–Brahmaputra river in Bangladesh. On average, 50 % of the water samples contain arsenic above the World Health Organization guideline value of 10 μg/L in India and Bangladesh. More than 100 million people in the GMB plain are potentially at risk. The authors’ medical team screened around 155,000 people from the affected villages and registered 16,000 patients with different types of arsenical skin lesions. Arsenic neuropathy and adverse pregnancy outcomes have been recorded. Infants and children drinking arsenic-contaminated water are believed to be at high risk. About 45,000 biological samples analyzed from arsenic-affected villages of the GMB plain revealed an elevated level of arsenic present in patients as well as non-patients, indicating that many are sub-clinically affected. In West Bengal and Bangladesh, there are huge surface water in rivers, wetlands, and flooded river basins. In the arsenic-affected GMB plain, the crisis is not over water scarcity but about managing the available water resources.